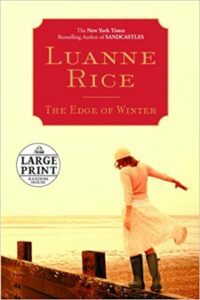 The Edge of Winter is a beautifully written tale mixing the present day with a unique part of World War II history in Rhode Island. Neve and her daughter, Mickey, live in a small coastal town in South County. Mickey’s love of birds has her risking her life to save a rare Arctic Owl. With the help of a local surfer, they head to a bird sanctuary run by an old World War II veteran, and the father of the ranger that patrols the beaches. As the richest man in town seeks to pull up the old German sub from off the coast to make it into a tourist attraction, Mickey and her new friend seek to stop it. Neve, meanwhile, struggles to pay the bills as she tries to get an art show off the ground of a mysterious painter native to Rhode Island. Her interactions with the ranger opens up her heart a little more as she lets love back in. The history of this sunken German sub is so unique and worth the read (if you can get past the love story). A relative of Rice was on the American sub that shot the German sub down, so she has very rich details to share of this moment in US history that they don’t teach in the history books.